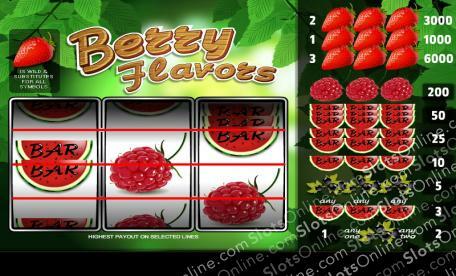 Taste the extra sweetness that the fruit in this slots game have to offer. Click here to play! Spin these tasty treats across the reels and you'll be taking home some cold hard cash! As you might expect from a fruit themed game, you're aiming to collect the fruit across the single pay line. Strawberries might be everyone's favorite treat, but they're extra sweet in this game. Spin three of them and you'll get the jackpot worth up to 3000 credits. They are also a wild symbol and will substitute for all other symbols to help you bring in more delicious wins. Next up in the list: raspberries. Spin three of these tart little berries and you'll get up to 200 credits. Don't forget about the watermelon BARS. There are triple, double and single BAR melons and all three will pay out if you can spin them across one or all three of the pay lines. Finally, we've got blueberries. These can bring in up to 5 credits. Spin these reels to taste the sweetness of slots success and you might just walk away with plenty more than a basket full of berries. The juicy strawberry acts as a wild symbol and will replace all others to help you create more wins. If you can spin three of them across the pay line, you'll get up to 3000 credits.